As our children have gotten older and become more interested in celebrating New Year’s, we have found ourselves adding a few new traditions. We make ice cream sundaes, drink fun drinks from fancy glasses, make a lot of noise, throw confetti, and play games. As this year draws to an end, I’m excited to add another tradition to our New Year’s celebrations: Year In Review questionnaires. The years fly by way too quickly and kids change so much from year to year, so I’m looking forward to having this record of their year. 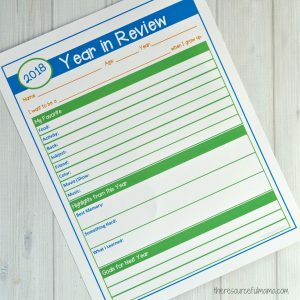 I’m anxious to read the kids’ responses this year and will enjoy pulling them out from year to year to see how much they have changed and grown. 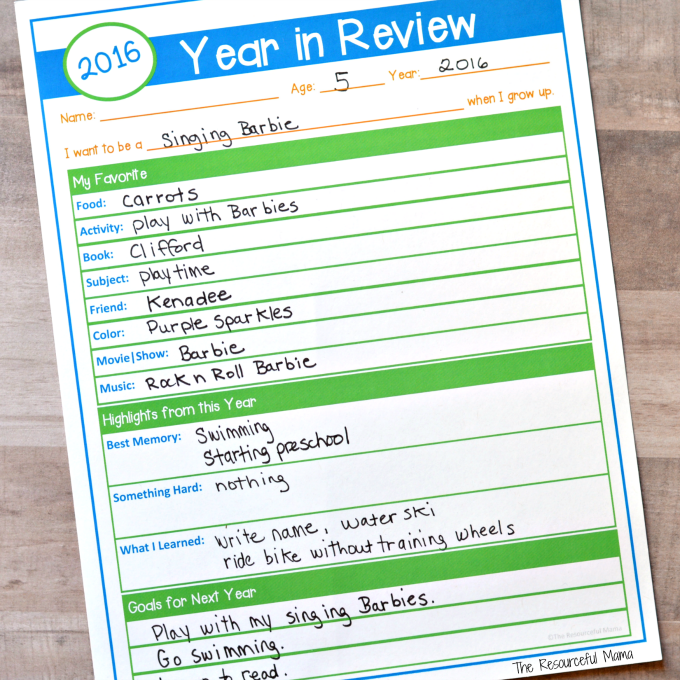 These Year in Review questionnaires are also a great way to open up a dialogue with your child and reminiscence about your family’s year. It’s always interesting how members of the same family can remember events and stuff differently or place more importance on something than someone else. Download the questionnaire and print this on your regular 8 1/2×11″ printer paper. If your child is not yet reading and writing, you can read the questions and fill in your child’s responses. If you child is able to read and write encourage them to fill in their responses as we did with our first grader’s questionnaire. We probably should have used pencil (and eraser) on his, but I was worried about the pencil not showing up in pictures. I love his responses! Some were expected and others were surprises, like Fuller House. 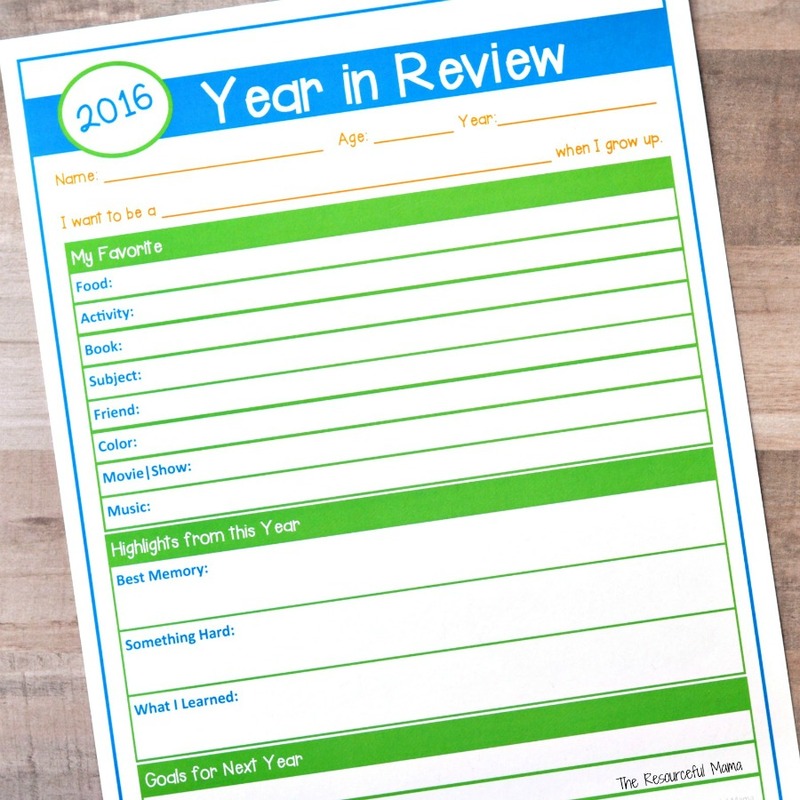 This Year in Review Questionnaire was made to be used with multiple ages, so there were parts of the questionnaire that our younger ones did not understand and were more difficult to complete, such as setting goals. We just talked about what they would like to do in the coming year. 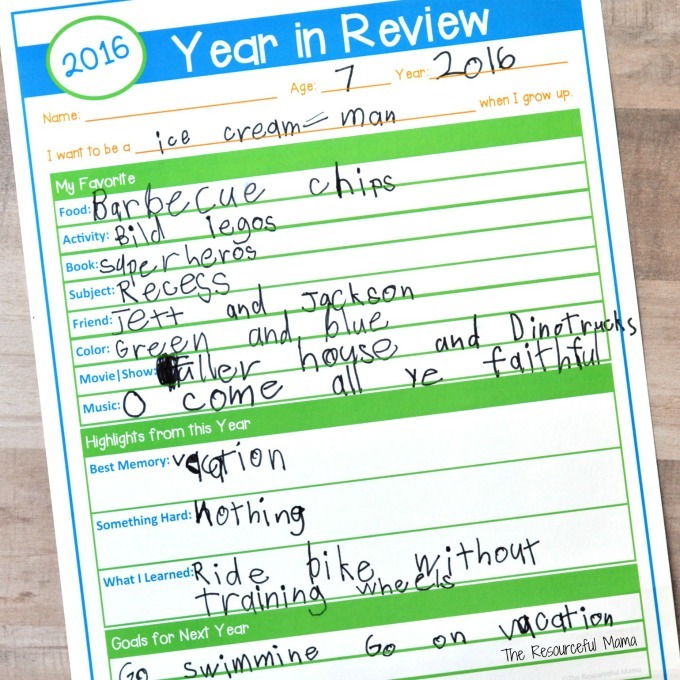 I actually had our oldest in mind as I made this Year In Review questionnaire and I’m looking forward to him completing one soon! Our youngest two jumped at the idea and wanted to complete their’s right away.